AGW Long Stroke parallel pneumatic grippers provide rigid secure gripping of large and wide parts. Now available from three-quarter inch, one, two, four and six-inch stokes. This versatile wide body gripper has wide range sizes and gripping forces for most any industrial application. Grippers range from 50 lbs. to units that have 150lbs. of gripping force. This unit is ideal for machining or dirty environments because of its sealed design that repels chips and contaminates from its internal mechanism. Each jaw is supported by two full shafts through the length of the body allowing for heavy loads, long tooling jaws and have large tool surfaces for ease of tooling attachment. 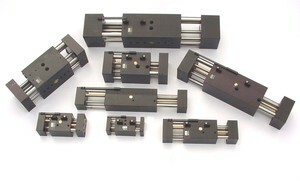 This unit is available in synchronous or non-synchronous for independent jaw motion for non-centering applications. The grippers are rack and pinion design to synchronize each jaw. The long stroke capability of this gripper combined with its heavy-duty jaw guides provides a very robust gripping package. The Gripper is available in four bore sizes and six strokes 0.75", 1.00", 2.00", 2.50" 4.00"and 6.00" jaw travels available, which provide superb adaptability to meet a variety of applications. All bodies feature dowel pin holes for accurate gripper mounting alignment. Optional inductive proximity switches are available for indication of jaw position and simple interfacing with electronic system controls. A choice of metric or imperial mounting holes, dowel pin holes, and air-ports are provided.